Regression? How about Progression? 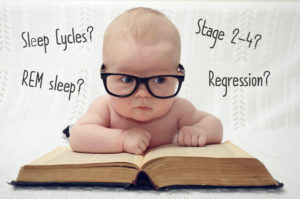 The Four-Month Sleep Regression Explained. As a professional sleep coach, I hear the term “regression” used in regards to just about every imaginable circumstance. Essentially, if baby doesn’t sleep well for a couple of nights, parents start dropping the ‘R’ word. Some people subscribe to the idea that there’s an eight month regression, a 9 month regression, a 1 year regression, as well as teething regressions, growth spurt regressions, and so on. Others see these as simple hiccups caused by extenuating circumstances. The other major contributor to this 4 month fiasco, I find, is that up until this point, parents have either been putting their baby to sleep with a pacifier, or by rocking them, or by feeding them, or some similar technique where baby is helped along on the road to falling asleep. For those of you in the latter camp, I’m happy to help in any way I can. Just visit my website or give me a call and we can work on a more personalized program for your little one. The most common thing I hear after working with clients is, “I can’t believe I waited so long to get some help!” So if you’re considering hiring a consultant, now is absolutely the time. I offer a free 20 minute evaluation so I can get to know the specifics about your little one’s situation. So book a call now and we can move forward as soon as you’re ready to get your little one sleeping through the night!